To liven up the face, rouge was mostly used. But there was rouge… and then there was rouge. The rouge of the woman of quality was not the rouge of the woman of the court. The rouge of the middle class woman was not the rouge of the court woman or of the woman of quality, even less that of the prostitute. It was only a soupcon of rouge. At Versailles, the princesses wore it very bright and very highly-coloured, and when the women of quality were present at court, they had to have brighter rouge than usual on that day. Court makeup can be assimilated to theatre makeup. The ladies of Versailles were on stage. A letter from Voltaire attests to all the trouble that Marie Leczinska had, to conform with this fashion of illumination, upon her arrival in France. Women who would have preferred to have abstained from painting their faces, were unable to go without it, for fear of appearing cadaverous in the middle of all of those reddened faces. As was to be expected, the use of rouge did not take long to spread from the French court into all of the European ones. Even Russia rushed to adopt it. Catherine recounts in her Memoires, that the first present made to her by Empress Elizabeth, upon her arrival at court, was the petit pot (little pot). That was how the china capsule containing the rouge was called. “To be allowed to use the petit pot” was every young girl’s dream. 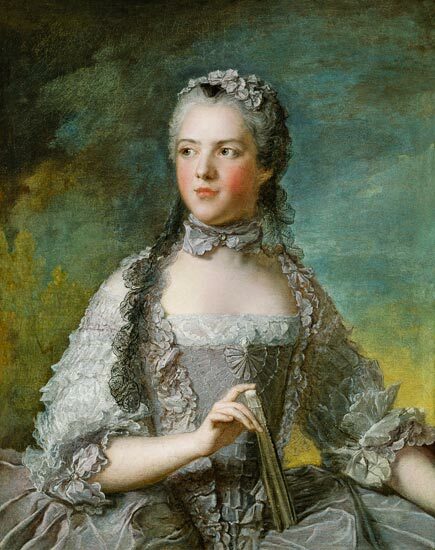 In Madrid, the Countess d’Aulnoy, assisting a court lady to dress, saw her dip a brush into a cup full of rouge, and paint, not only her face, including the interior of her nostrils, but also her ears, her hands, her fingers and her shoulders. This custom, which seemed disgusting to her, had become obligatory. The most refined women cleaned their faces with a mixture of sugar and beaten egg-whites. They had difficulty getting rid of the dreadful mastic, which finished by leaving a sort of shiny varnish on the forehead. Rouge was more than ever in fashion under the reign of Louis XVI. From the Dauphine down to the lower middle-class, all women used it. It is not surprising that, at this epoch, the Queen, who had her Fashion Minister, also had her Rouge Merchant. I wrote an article about 18 century makeup, for beauty, women and men risked death or worse. Very interesting, Richard, thank you! E., applying rouge was a delicate process although I am not sure they cared about the subtleties of making make-up look natural as we are today. What was with the whitening of the faces? I heard women would ingest minute amounts of arsenic (?) in order to render their complexion pallid. There is a scene in "Gone ith the Wind" about that, and a French court scene in the TV miniseries, "John Adams" showing the hideous make-up. Grotesque! Only peasants had tanned skin and so the whiter your skin was the more aristocratic you were. Funny story: I once overheard two tourists, a lady from Germany (I think!) and a lady from the United States, discussing a Filipina they had just met during their visit to the Philippines. That Filipina was using a special cream to lighten her complexion, and the American lady had just warned her, "There's nothing but bleach in that! It's bad for your skin!" --and the Filipina had said that she didn't care as long as she could look lighter. Then the two women agreed that the perception in the Philippines is very different from what they have in their respective homes. Over here, the more tanned you are, the more likely you are to be a field hand or a menial labourer; where they come from, the more pale you are, the more likely it is that you're stuck in an office all day and deprived of the sunlight! Very funny! I remember my grandma, born in the Philippines, telling stories like that!